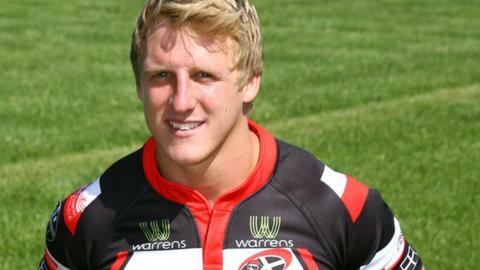 Cornish Pirates centre Drew Locke will leave the club at the end of the season to join Gloucester. The 25-year-old first arrived at the Championship club in July 2010 on dual registration from Exeter Chiefs. He impressed during the 22 appearances he made for the Pirates in the 2010-11 season and agreed a full-time contract at Mennaye Field last summer. Head coach Bryan Redpath told BBC Gloucestershire: "He can play centre or wing so can cover the midfield area." Redpath continued: "He'll come in with an opportunity to push Billy Twelvetrees, Tim Molenaar and Henry Trinder. He's an exciting young man with a lot of passion and hopefully he can add to the squad. "He's dangerous, scores a lot of tries and has that hunger that can be vital." Pirates chief executive Rod Coward added: "Drew has shown himself to be a good, consistent performer. It comes as no surprise that he's attracted the interest of Premiership clubs. "We wish him every success at Gloucester."